There isn’t a kid on earth who doesn’t like kids’ train sets. They guarantee endless fun. In fact there are many grown ups who are fascinated by trains and there are many manufacturers that make high-end train ‘toys’ for adults. If you want to become the favorite aunt, uncle or neighbor, just forget everything and buy the kid one of these train sets. This beauty comes in a clean container that fits all of its pieces. 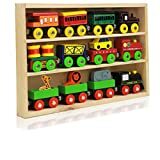 The Deluxe Wooden Train set contains 35 pieces that include straight and curvy tracks, policeman, animals, houses signals and stop signs. This set contains four animal cars, four construction cars and four passenger trains. It is compatible with the infamous Thomas the Train set as well. This set comes in a very fine wooden box. 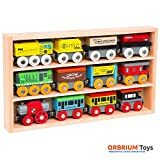 Like the above mentioned collection, the 12 Piece Wooden Enginer and Train Cars set by Orbrium Toys is a fantastic collection. It is slightly different in design than the collection mentioned before it. I thought I should include it because I love both of them. Another beauty by Orbrium Toys. This large 52 piece train set has everything including a stunning bridge. You can build tracks over or under the bridge. A great way to teaching toddlers the basics of construction. This one is my personal favorite. The train set contains actual puffing smoke that, to be honest, is quite irresistible for even adults. This set includes three different cars and a monumental 11 feet of railway tracks. Ideal gift for birthdays, Christmas and holidays. Let me put you in a difficult situation by introducing you to another train set with real smoke at amazing prices. It also comes with three different cars and ten different set of railway tracks. Good luck in not-trying-to-buy-this. And last but not the least; this kid’s train by the renowned CAT company is sure to tempt you. Bright yellow coloring, great design, fine finish and 100% non-toxic material. The button cell batteries are also included in the train set.